Next on our Thailand Island hopping tour was the ever popular Ko Phi Phi. This involved a 14 hour overnight journey from Koh Tao consisting of a 9 hour night ferry, 2 hour bus journey then another 2 hour ferry, with a little waiting in between. 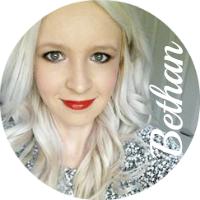 With Bethan very prone to sea sickness, she quickly fell asleep after taking medication. The others however passed away the time playing a game where you make up a story with each person only adding five words at a time - lets just say things got hilarious when Barney the Dinosaur got a mention! 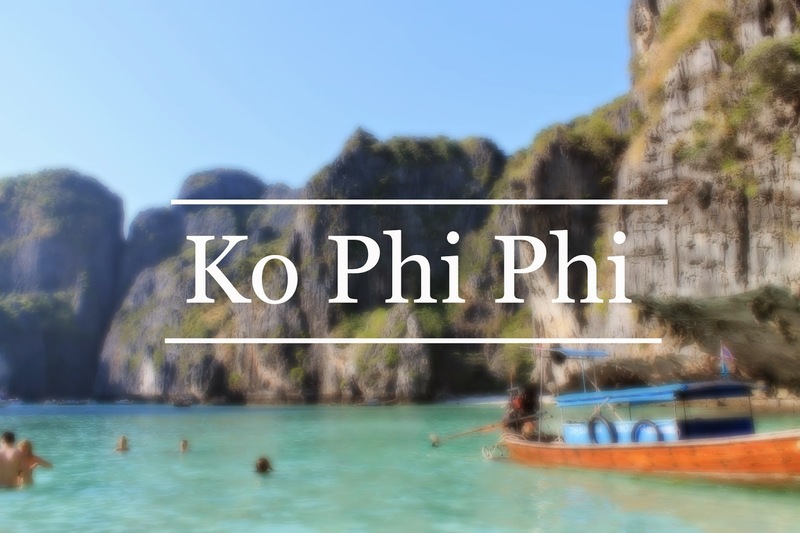 Ko Phi Phi is a very small island so we didn't think it necessary to book our accommodation in advance, as we have found that sometimes the best deals can be found by just walking into a few places. This way you still have the chance to bargain down the price a little. After visiting a handful of places, we decided on Centrepoint Hostel, which offered a reasonable priced dorm room in the center of everything. After dropping off our bags it was time to explore the island and take a look at some of the activities on offer. Sarah and Sophie decided on a boat tour of the surrounding area and Bethan, Sam and Rebecca thought a couple more scuba dives would be good. Sarah and Sophie went off on their long tail boat trip for the day where they would explore the surrounding area of Ko Phi Phi. First stop was Monkey Beach where they hopped off the side of the boat into the crystal blue seas to watch the tourists feed the many monkeys! They had mixed feelings about this as people who had paid more money for their tour turned up in bigger boats and were throwing lots of bread and bananas from the boat which eventually found its way into the sea. Needless to say, it quickly ruined the look of the beautiful sea so they swiftly stopped floating in the water and climbed aboard the boat. Next stop was Maya y which they were very impressed with! If you know anything about this place, you know it's most famous for it's peaceful white sand beach and amazing scenery of the surround cliffs. However, we were in Thailand during peak season which meant the beach was filled with people and boats again! No matter where they tried to swim in the sea, they'd eventually get moved by a boat looking for a space to park and bring even more people to the bay. They still thoroughly enjoyed the views of the bay and the clear waters, I guess we can always go back another day when it's quieter :P We also stopped in the middle of the sea about 5 minutes away from the bay to let people hop off and do some snorkeling to see the fish who live on the reefs. The visibility of the water that day wasn't the best but it was still fun to see, it's got nothing on scuba diving though haha! We were also given our meal for the day which consisted of some fruit, a sandwich and plenty of drinks before heading to the best point to watch the sunset over the water.. so pretty! The trip back to the mainland was interesting as suddenly the sea became really rough with huge waves which were throwing the boat around. It wasn't long before the waves started being bigger than the boat resulting in everyone becoming soaked as we sped through them.. it sounds a lot more scary than it actually was, it was absolutely hilarious!! The rest of the girls had a shock when Sarah and Sophie eventually found their way back to the hostel as they were dripping from head to toe! 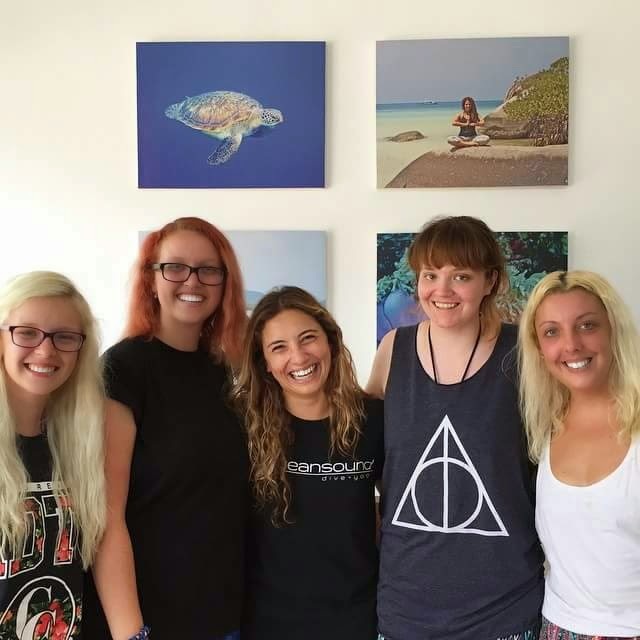 Sam, Bethan and Rebecca booked 2 fun dives with The Adventure Club as these had been recommended to them from our previous dive instructor. We were a little nervous at first because these were our first dives as qualified divers. So our guide would literally be just that, obviously there for any emergency situation but we were ultimately to take care of ourselves. The company were having some trouble with their boat, so after a good half an hour delay we were told that we were to swap onto another companies boat which would take us to the dive sites. Now that this boat had twice the number of expected people it really was feeling a little crowded. This didn't matter to us though, we got a good lunch included and unlimited tea and coffee. First we headed out to a location called Bida Nok. This dive lasted 50 minutes and we saw loads of cool things such as, Scorpion Fish, Puffer Fish, Banner Fish and Clown Fish. Next was a place called Maya Corner which is close to the very famous Maya Bay. Here we saw Hermit Crabs, Sea Snakes, Moray Eels, Angel Fish and a 'Marie Antoinette' Lobster (the lobster was missing its head). As we were waiting on the surface for the boat to come and pick us up it was clear that Bethan was having some problems with her BCD. The air was leaking out which meant that she was sinking beneath the surface again. She informed our dive master who gave her a buoyancy aid to help keep her afloat. As the boat was nearing she must have signaled for help because they threw out a ring to hold on to and the next thing she knew she was being towed back onto the boat. This was going to continue as a little joke between the girls - "Oh Bethan, remember that time you had to get rescued and towed back to the boat?" haha! 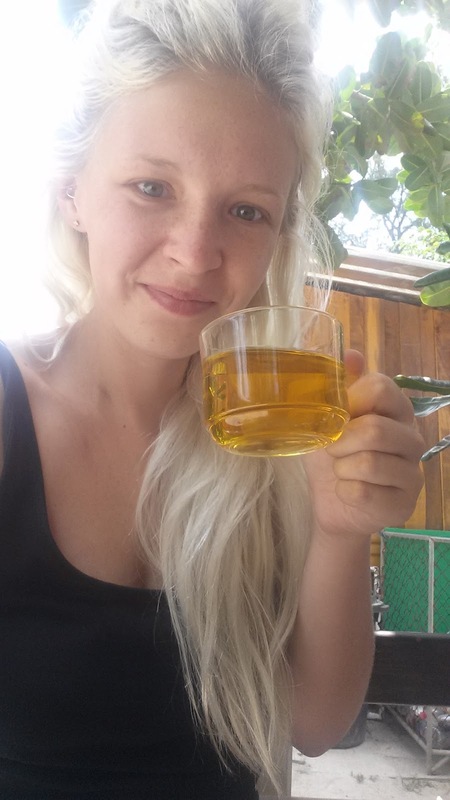 The next day was Sarah's Birthday - THE BIG 22, so obviously celebrations were in order! We were all super excited to get dressed up for the occasion! Yes, Thailand is known as a huuuge party destination but we're not really ones for going out for loads of drinks all the time. So when such an occasion arrives we tend to go all out! After more minutes than we care to admit getting ready, it was finally time to head down to the beach to begin the celebrations. Before we even arrived at the beach we spotted a small stall selling drinks for a very reasonable price, we were no doubt going to get ripped off at the bars and with the beach being a very open location it was okay to bring your own alcohol to the parties. 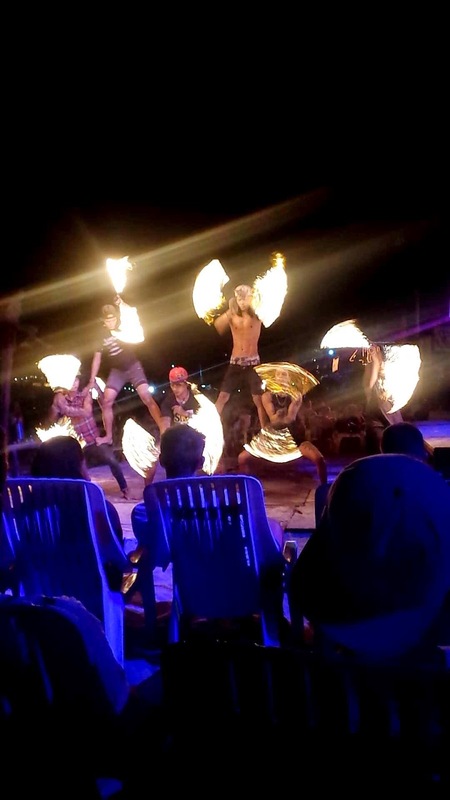 We all decided that a bucket (yes, a bucket) each of strawberry daiquiri would be the best choice then headed down to settle at the beach to watch one of the fire shows. The fire show was really impressive with about 10 men performing all manner of dangerous tricks for our enjoyment. There was also some audience participation in the form of a burning skipping rope where you were rewarded with a shot of alcohol if you could do it for long enough. 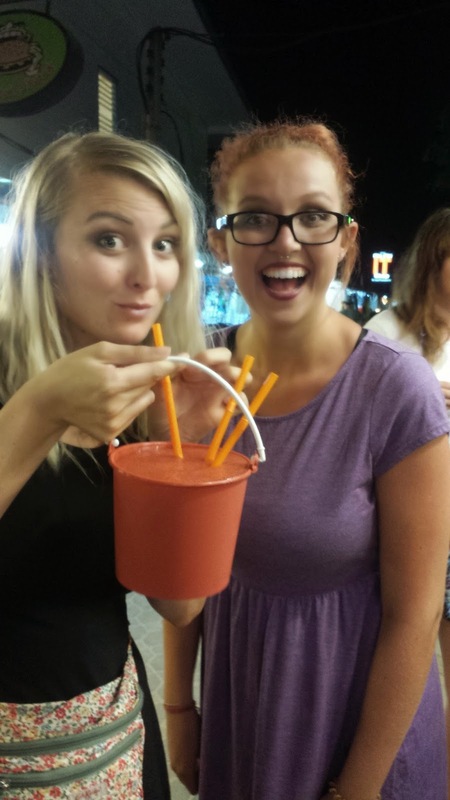 With the drinks flowing and Sam and Rebecca on their second bucket of the night we decided to take a walk along the beach to see what was going on in some of the other bars. Luckily enough it wasn't really that busy so we took a table and had plenty of room for dancing. Soon enough Sam was feeling the effects of the alcohol so decided to call it a night and it wasn't too long before everyone else was feeling the same. Rebecca however wasn't too keen on going home so proceeded to try and drag Bethan into the sea with her. After much persuading we eventually all found our way home and Rebecca found her way into Bethan's bed. 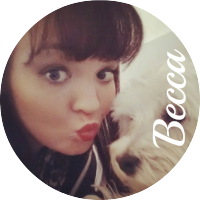 It was cute because she had also brought her own pillow and her dog Barney along for the cuddles ("We do love to spoon when we're drunk don't we Beth?" hahahaa)! The next morning a couple of us were feeling a little worse for ware so a few deliveries of chicken nuggets and chips were made to our bedsides. Once we were feeling better we all heading down to the beach for some much needed relaxing to sleep off those hangovers. 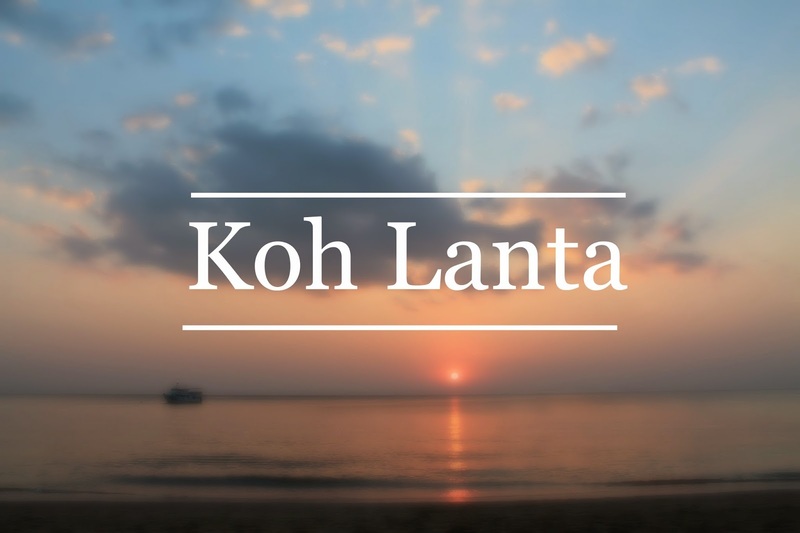 Next stop another Thai Paradise island - Koh Lanta! We got on an 11.30am ferry from Koh Phi Phi to Koh Lanta which took around 2 hours and cost around 400Baht, (£9 per person). The ferry this time wasn't too much of a problem for anyone, the sea was very calm and there were outside seating areas for fresh air. 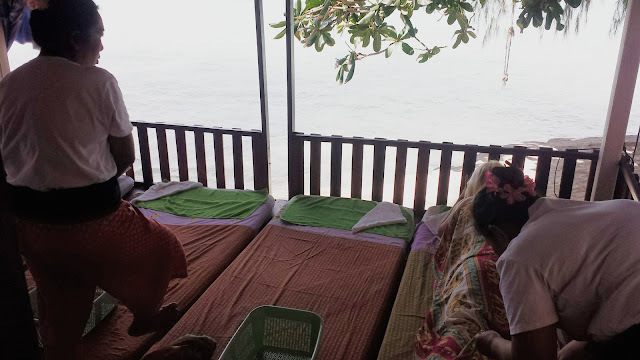 Arriving into Koh Lanta we again had no accommodation booked as all the options we had found online were a little out of our budget. Getting off the ferry we found a tuk-tuk driver who said he knew of a few cheaper places so we hopped in expecting to view a few rooms before finding one that suited us. We were pleasantly surprised when we pulled up to our first location The Leaf House Bungalow. It was a small garden area with a few two storey beach shacks surrounding it, with a larger hut used as a social area and numerous smaller undercover seating areas, all within a stones throw of the beach. We all jumped out of the tuk-tuk thinking that this place was going to be well over our budget. The lady said that the only room she had available was a 5 bed dorm room above the social area, and upon showing us we completely fell in love. We negotiated a good price for the room and even got ourselves a free breakfast thrown in. We were all feeling pretty excited about having the beach so close, so we got into our swimwear and headed straight there. Rebecca and Sophie being the most excited of us all, literally dumped their stuff and ran into the sea. After about 20 seconds there were a lot screams coming from Rebecca and we all started panicking thinking she had got into some sort of trouble. As fast as she ran into the sea was as fast as she ran out of it again! She comes over to us claiming that she is covered in this horrible slimy stuff, which we later found out to be jellyfish babies! Luckily enough they were too young to sting yet, but from then on nobody wanted to enter the water. Because of this we found that lying on the beach was complete torture as we couldn't enter the sea to cool down. After only an hour or so Bethan and Sarah gave up and walked back to the Bungalow. 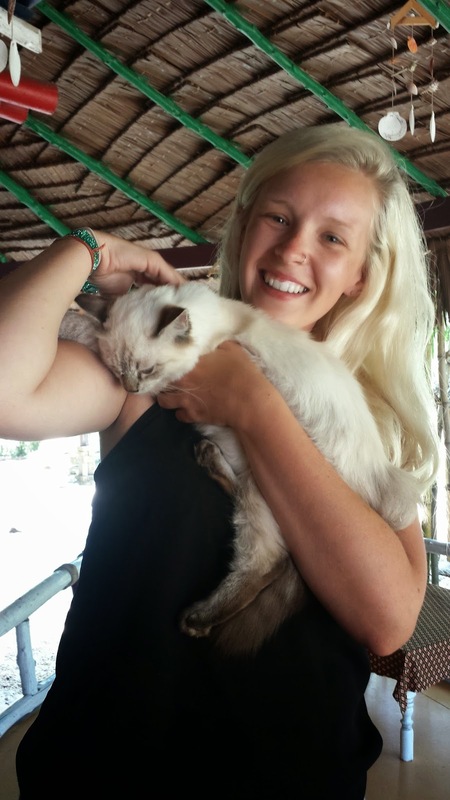 That night we were delighted to find so many cats living at the hostel. The cutest one was this white and grey one who took a special liking to us and even followed us up the stairs to bed. The next day we were all feeling like we had had enough of the sunbathing so we headed out to a coffee shop for some food and a few cups of coffee. After an amazing feed we wandered up and down the main road going in and out of a few shops. But, the area in which we were staying didn't really have too much to see so it wasn't long before we found ourselves at the bungalow again. Missing our scuba diving we thought watching Finding Nemo would be a good idea - of which we all enjoyed (even Rebecca)! That evening we headed out for a walk on the beach to check out some of the food places. We settled into one of the restaurants, ordered the same amazing pasta dish and Sarah ordered a pizza which we thoroughly enjoyed. After a short 2 night stay we decided that there wasn't really enough to see here, so we decided to move on to Krabi. Sorry for the lack of pictures but we really didn't do too much. We left on a sleeper bus from Bangkok which took around 9 hours and watched the sunrise as we waited 3 hours for our ferry to leave for Koh Tao. We were treated to a few episodes of Mr Bean while on the boat. Maybe due to a lack of sleep or just poor sea legs but Bethan got very sick on the ferry and spent most of the time locked in the bathrooms. As we were nearing the island we were greeted with the most beautiful landscape - shimmering blue ocean, amazing limestone formations and what looked like a forest of palm trees, a sense of excitement was among us. It was a great relief after 2 hours sea crossing to finally be on solid ground again. We exited the port to try and get a ride to Good Dream Hostel at Sairee Beach and were horrified at how much the taxis were charging (around £10 for a 3km drive). But with no other option we hopped into the back of an open top truck for the short ride. We dropped our bags at the hostel and went for a walk to find breakfast. Just a 2 minute walk away was a cafe serving Italian coffee and pancakes - win! Even that wasn't enough to give us the energy for the rest of the morning so we decided to give in to the comfort our beds had to offer and take some rest. Just a few hours later we couldn't resist the urge to explore any longer so went to check out the beach and the town - our bodies are always telling us how tired we are but our inquisitive nature wont allow us to keep still! We soon settled into a cosy place on the beach front to order some dinner. We all got a range of the delicious Thai food on offer, and Bethan really could not shut up about "THE BEST MASAMAN CURRY EVERRRRR" for at least a week afterwards (yes we did go back numerous times during our stay). At this place we were also treated to a fire dance show. Usually these can get fairly elaborate with many people taking part and complex skills involved. This one was a little more low key as there was only around three men taking part, but we really enjoyed the audience participation. 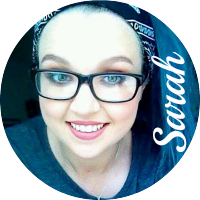 At one point Sarah had a few flaming balls dangled over the top of her head :P - better to ask her for more information. Our time in Koh Tao was split between Sairee Beach and Chalok Bay where we attended Ocean Sound Dive School for our PADI Open Water course. We have an entire blog post on this here. So after our final morning of diving, getting our ever so flattering PADI certification photographs and saying our saddened goodbyes, it was time to move back to Sairee Beach for a few days. As previously mentioned the taxi service on the island is extremely expensive so Bethan came up with an, admittedly long winded but genius plan! 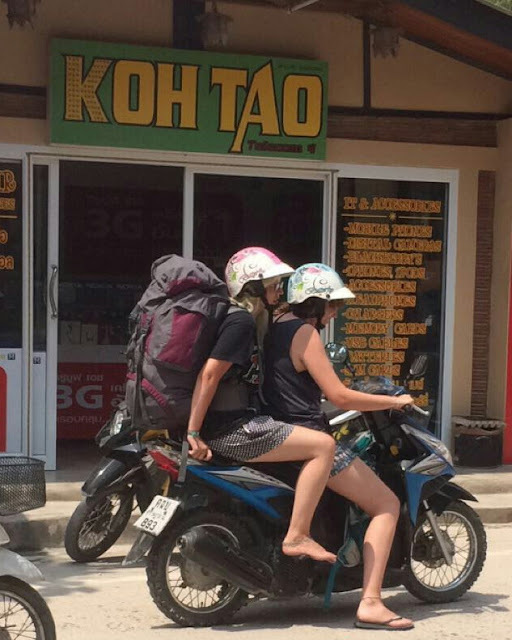 We were to hire one moped and drive two of us (with backpacks) to Sairee beach where we would hire another moped, both drive back to pick up the other girls and keep doing trips back for fore until everyone and their luggage were safely in Sairee beach again. This plan actually worked out perfectly and Bethan was feeling ever so smug! 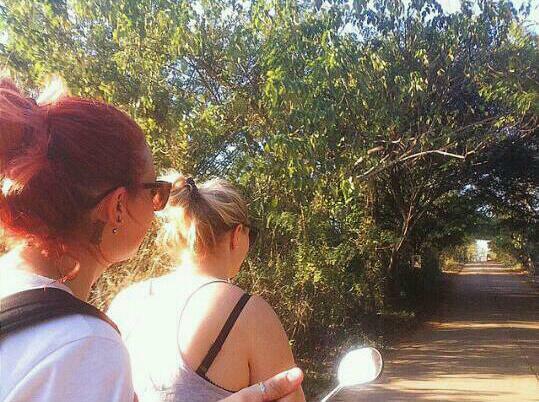 Feeling confident we hired yet another bike so that all 5 of us could explore the island together. As the hire of the bikes lasted 24 hours we still had the bikes to explore the next morning so we chose a random point on the map and off we went. Looking back now we should have thanked ourselves lucky that we had explored with no problems the day before and left it at that! The point we chose on the map happened to be up an extremely steep hill, and with our tiny engines and 2 persons per bike we couldn't quite make it. Bethan and Sarah were first up the hill and when Sarah realised the bike was slowing down and unable to make the incline, she thought it a great idea to just jump off. Of course with the bike now having less weight and Bethan full on the accelerator the bike suddenly sped off and Bethan lost control and fell onto the side of the road, falling backwards off the bike and landing directly on top of Sarah. Next was Sam and Sophie sharing a bike, who had a more graceful landing, although falling the bike on the floor. And Rebecca being by herself had no problems whatsoever but decided she should stop to see what all the commotion was about. Believe me it sounds a lot worse than it actually was, nobody was hurt - at least not physically. Our purses were really feeling the pinch the next day when we had to return the bikes, now covered in scratches to hear of a hefty bill we had to pay. Shops on the island of Koh Tao have a really bad reputation of trying to scam tourists into paying for damage that isn't there, or overcharging them for tiny scratches as they claim the bikes have to be in immaculate condition in order for them to be hired again. We knew we were going to have to be charged for the damage on the bikes as there were very clear scratches pretty much everywhere. But, when we were hit with a bill amounting to over £350 we knew our guy was trying to rip us off! After refusing to pay such a hefty price we headed to the police station for advice (the bike rental places ask for your passport as deposit so there is no way you can simple walk away without paying as you would be without your passport). The police were actually quite helpful and headed up to the shop with us to have a talk with the guy and in the end we paid just £50. Apparently this particular shop is well known for this type of scam and the police assured us that he is now on this final warning. It's fair to say things got a little awkward over the next few days as our hotel was directly opposite his shop! Over the next few days we noticed the island getting more and more busy as people were heading over from the neighbouring island of Ko Phangan after the full moon party. Queueing for over 15 minutes in the local 7/11 shop wasn't our idea of fun so we though it best to head off ahead of the crowds and book our transport to another island, Ko Phi Phi. 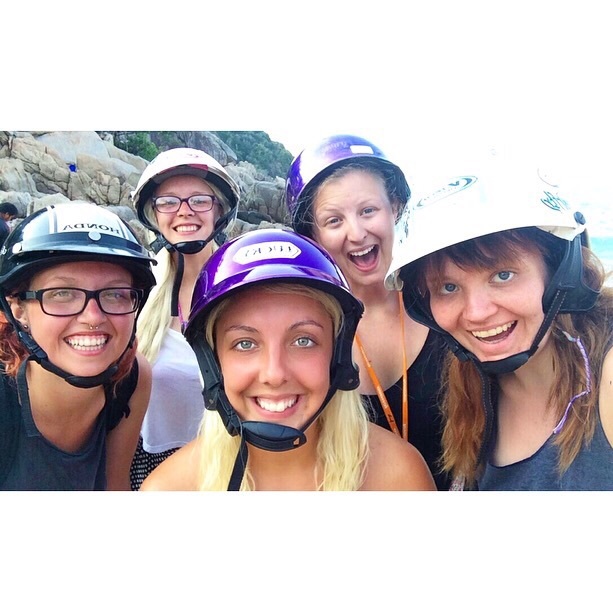 So for our final day on Koh Tao, Bethan, Sam and Sophie headed out to try a Thai massage. They found a really cute place with the massage beds placed outside on a balcony area overlooking the clear blue sea - it was soooo relaxing. Thai massage is a very love it or hate it kind of thing as they can be a little brutal. We found that if you just relaxed into the experience instead of fighting against it, it made for an amazing massage! After getting our complementary green tea and Bethan getting her hair brushed and restyled by one of the ladies we heading for one final explore of the shops. Feeling super relaxed from the experience Bethan decided that now was as good a time as any to get the nose piercing she has been waiting for ages. 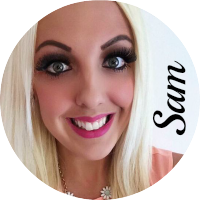 We simply called into one of the many tattoo and piercing shops, bargained for the price she wanted (£11) and within a few minutes there was a huge needle through her nose and a shiny silver hoop. Still smiling even after the incident! 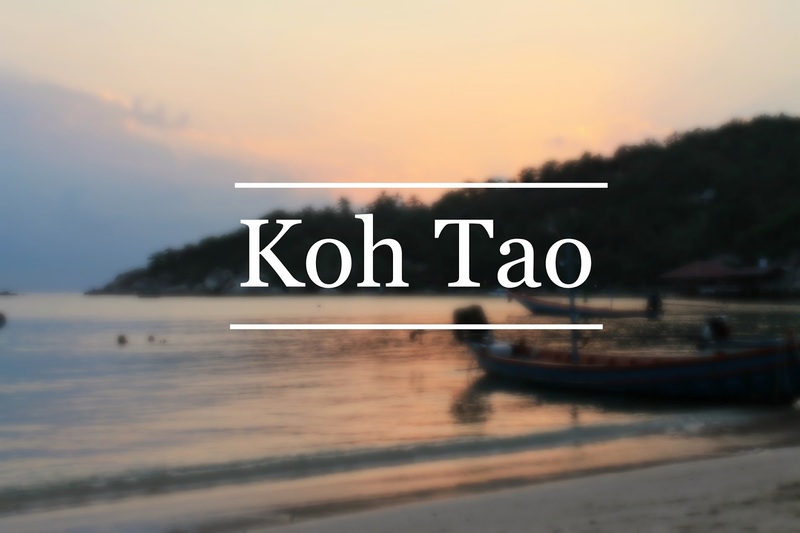 If you know anything about Koh Tao you will know that it is famous for scuba diving. As a result there are countless dive schools dotted all around the island which makes choosing one a challenge in itself. A week or so before arriving we took to TripAdvisor for a list of the best schools on the island and contacted the top 5 for more information. They all got back to us with similar information and prices which again we were none the wiser as to which one to choose. 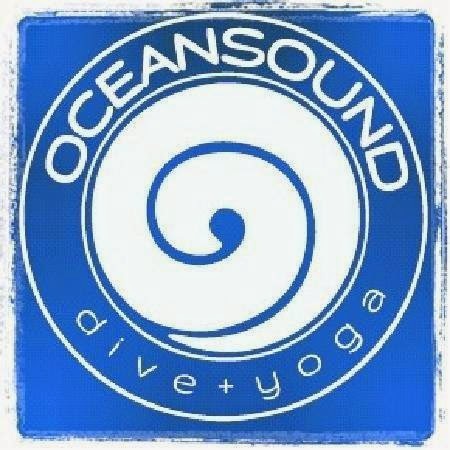 After reading reviews in more detail we decided that a smaller, more intimate school would be preferred so opted for Ocean Sound Dive and Yoga (which are currently number 1 on TripAdvisor, no doubt they deserve it!). We decided to take the plunge and book to do our PADI Open Water Qualifications which would allow us to dive up to 18m all around the world - providing we passed of course! On arrival at Ocean Sound we were greeted by Jesper and asked to fill out a health questionnaire and pretty much sign our lives away. After a quick introduction to the schedule we would be following and most importantly locating the free tea and coffee station, we were taken to our seaside cabins. Ocean Sound are located in Chalok Bay on the south of Koh Tao, away from the madness of Saree Beach where we had stayed previously. We stayed at Tropicana Resort where we were lucky enough to secure 2 beach front cabins just a few metres from the ocean! We had a few hours to spare before we needed to head back to the dive shop to begin our course, so we took a wander around the Bay to orientate ourselves and scope out the good looking bars and restaurants. Now it was officially time to begin dive school! We were introduced to our dive instructor Mariana - she was so friendly and easygoing it was clear we were going to have a good time. For the rest of the afternoon we watched a few sections of a DVD and were sent away with some homework. Being the star students that we are, we brushed that off, went for dinner and then all got together at around 10pm to go over our answers (sorry Mariana if you're reading this :P). Nevertheless going over our answers the next morning we had no problems, so it was time to go for our first try in the swimming pool! Now at the swimming pool we first had to prove that we could swim. Yes, believe it or not there are people who think they can scuba dive without having the ability to swim! We had to swim 500m and tread water for 10 minutes. Next we learned how to properly set up the equipment and carry out our buddy checks. Then it was time to take our first breaths underwater! Some of us found it more difficult that others to get used to this sensation, as you have to completely forget you even have a nose! Once Mariana was satisfied we were all comfortable it was time to begin our mask skills - filling it with water and learning how to get rid of it, taking the mask completely off and breathing without it for a full 2 minutes - all scenarios that could potentially happen underwater. Next we moved to the deeper pool and practised our buoyancy skills, taking our equipment on and off whilst in the water and around a thousand other things. We were all feeling much more confident now that we had had a few hours in the swimming pool, getting familiar with the equipment and perfecting skills we would have to demonstrate on our dives over the next couple of days. We loved that Ocean Sound carry out this session in a swimming pool rather than in open water as this reduced any anxiety we may have had. We all felt that going straight into the sea, which happens at many dive schools would have been very overwhelming. Mariana gave us even more homework to be completed that evening so we were ready to tackle the open waters early next morning. So the day was here - our first ever dive into the open water! We all had very mixed feelings, excited but also nervous as we were going into the unknown. Sophie wasn't doing any diving herself but she was allowed on the boat nonetheless which meant lots of pictures! The boat was amazing, not too crowded and we got free breakfast of eggs and toast and an endless supply of watermelon, pineapple, tea, coffee and hot chocolate. After our dive briefing and quick overview of hand signals of different type of fish we may see it was time to gear up and jump into the water. At Ocean Sound they keep the groups to a maximum of 4 students which increases safety but also makes for a better experience as we felt we really got to know Mariana. We found this first dive a little difficult as we felt like we had a million things to think about all at once. However, Mariana took it very slowly, always checking on us and it wasn't long before we were enjoying ourselves. From then on every dive we did got better and better. As we became more comfortable in the water we were able to focus more on the beauty that was around us rather than perfecting our buoyancy or controlling our breathing. We got to do a total of 4 dives for our PADI qualification, reaching a maximum depth of 18 metres. And within what felt like a blink of an eye we were officially qualified PADI Open Water divers! GO TEAM! We enjoyed our experience so much we were contemplating going ahead and doing our advanced course as well. However we thought we would save that for another location so we had diving experience in another part of the world. We all enjoyed every minute of our time with Mariana and Ocean Sound, they really are number one for a reason! Learning our hand signals - awkward turtle! Officially PADI Open Water Qualified ! After an amazing few days in Chiang Mai, it was time for us to leave and head to Pai which we had heard so much about from various people. After boarding the minibus, it didn't take us long to realise why the journey there came with a warning! 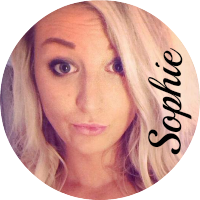 The winding roads and cliff edges were enough to make anyone feel ill and with Sophie suffering from travel sickness, she decided to take some medication and was soon as high as a fairy and oblivious to the entire thing. It was hilarious watching her trying to find her mouth while she ate a packet of crisps haha! When we arrived, we instantly fell in love with the look and vibe Pai had. Every little cafe, shop and bar were so unique from the last and the people were all so chilled out, we knew we'd love it there! It was a bit of a mission trying to find our accommodation as the directions we got from online were all wrong, eventually we had to get a local to ring them for more directions then get a taxi! Upon arrival, we were stunned at our accommodation because we were expecting so much less for the money we paid. 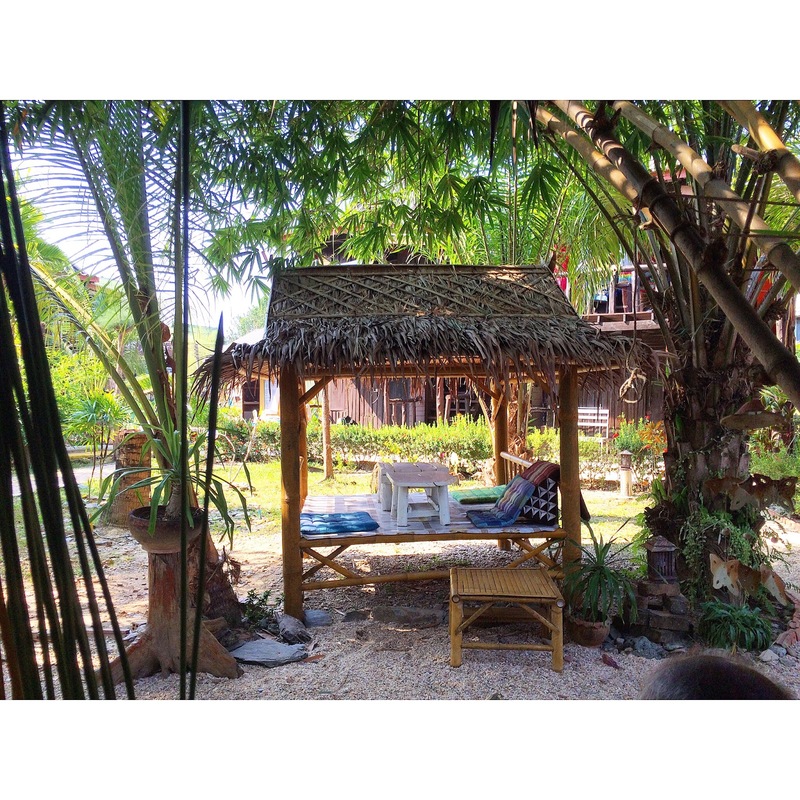 We stayed at Prod-Pai Prachaupmaoh Guesthouse and were given a bungalow on stilts all to ourselves, it was the cutest thing! It was about a 15 minute walk back into the main town which meant that we could sit on the balcony and enjoy the peace and views of the surrounding mountains. The women at reception soon informed us that there would be a weekend market in the main street that night and would taxi us there and back for free of charge, so off we went to explore the goodies Pai had to offer. The market was different from normal Thai markets, it still sold some of the classic purses, elephant printed trousers etc but also sold unique hand-crafted items like dream catchers, jewellery and clothing. 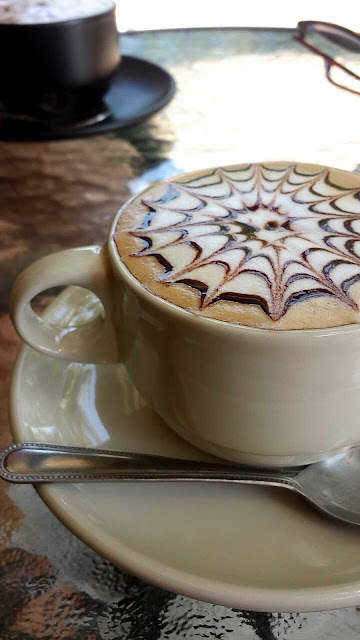 We ended up in a cafe which served the best variety of hot drinks and cakes for a good price, how could we ever resist!? The walls were covered by so many flowers, at first sight we thought it was a florist but soon discovered otherwise. 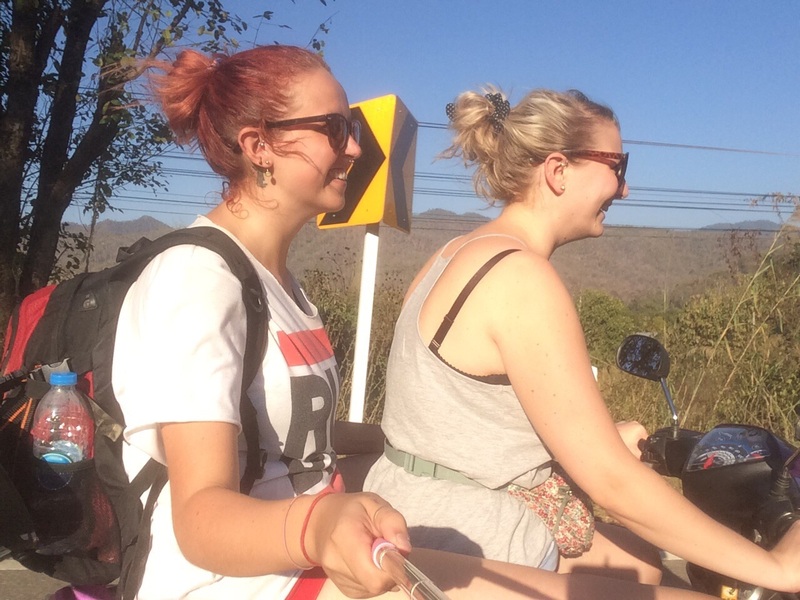 The next day we decided to hire a moped (which we named Phoebe) and head to a few of the local tourist spots. After a few runs up and down Pai's main street, Sophie eventually got the hang of how to ride it and we began the drive to the hot springs in Huai Nam Dang National Park. They were just a short walk from the car park and we were shocked to find that some were so hot, you could actually pay to boil an egg in them, who would do that haha!? We settled for the hottest one we could handle and made ourselves comfy as our bodies soaked in the natural minerals. There were plenty of signs in the park warning tourists not to stay in the water too long because if your body absorbed too much of the minerals, it can make you feel dizzy and unwell so we made sure to sit out for at least 5 minutes before moving down to the next one. After spending a bit too long relaxing in the springs, it was time to dry off and head to Pai canyon which was only a 10 minute drive away. 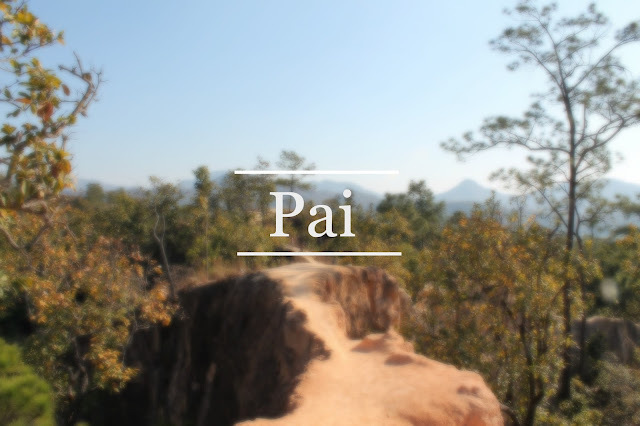 Some people say the canyon is Pai's answer to the Grand Canyon, it could more accurately be described as narrow red ridges with steep-sided valleys, both filled with pine forests. The steep 50m drop either side and stunning views over the surround countryside are impressive but we had to be extra careful because the path is extremely narrow in some places. 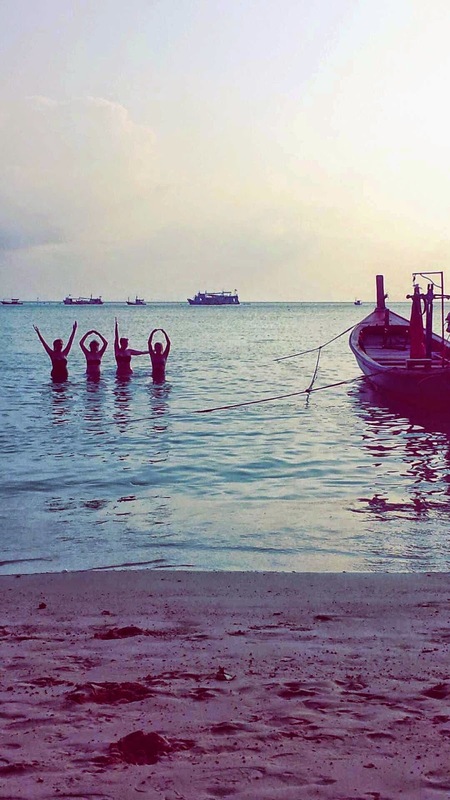 Next stop, Koh Tao to begin our PADI Open Water Scuba Diving course.. EXCITING! The most flowers we've ever seen in one room! Hot chocolate and cake before bed, perfect!